Greetings Wisconsin Sports Fans, it has been a very exciting March Madness thus far. Many brackets have already been busted after just the second round, but it has been exciting nonetheless. In particular for the Marquette Golden Eagles and the Wisconsin Badgers. Both teams are making Sweet 16 appearances in back to back years. Stellar play and great effort pared off as Marquette finished with a record of 25-7 and earning a #3 seed in the tournament. The Badgers finished the season with a record of 24-9 and were rewarded with a #4 seed in the Big Dance. Buzz Williams’ Golden Eagles matched up with the 14th seeded BYU Cougars. Marquette was the first to score and did not stop the whole game. Whenever BYU made a basket, Darius Johnson-Odom and Jae Crowder had an answer for the Cougars. The Golden Eagles led by as much as 18 points in the first half and finished the First half with the lead by a score of 49-34. As the the second half, it was just like the first. Marquette continued to score baskets and hold the BYU Cougars to thirty four points in both halves. Brandon Davies was the top performer for BYU, scoring 19 points and grabbing 12 rebounds for the Cougars. Jae Crowder had an outstanding double double; finishing with 25 points and 16 rebounds, while also dishing out 4 assists and 4 steals. The Fourth seeded Badgers squared off with thirteenth seed Montana Grizzlies. This was just another example of Bo Ryan’s excellent defensive style of play. The Badgers held Montana to just 49 points for the whole game. The Badgers were led by the offensive efforts of Ryan Evans and Jordan Taylor. Evans led the Badgers with 18 points while Taylor scored 17. Jordan Taylor attempting a three-pointer against Vanderbilt. In the third round of March Madness, both the Golden Eagles and Badgers were, as expected, matched up with somewhat tougher teams with Murray State and Vanderbilt respectively. The out-of-nowhere 31-1 Murray State Racers led the Golden Eagles 28-25 at the end of the first half. However, as we have seen Marquette a lot this season, is come back in the second half and just completely take control of the game. The Golden Eagles outscored Murray St. 37-25 in the second half to win 62-53. 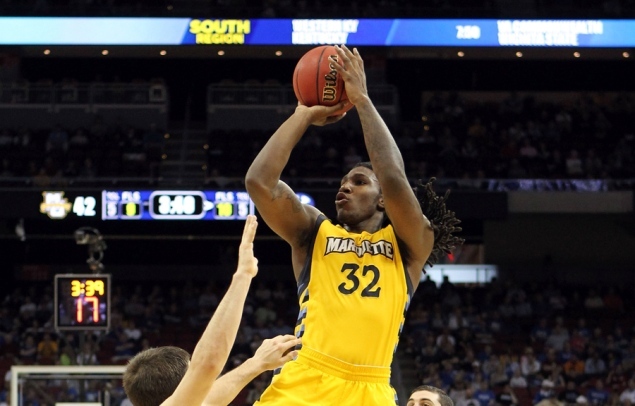 Marquette has continued to impress with their efforts with the absence of a healthy big man to play that five spot, and as always they were led by Jae Crowder and DJO; both scoring 17 points. As for the Badgers third round match up with Vanderbilt, things got down to the wire and the Badgers squeaked out a close win by a score of 60-57. Both teams were pretty evenly matched but the Badgers 10 three pointers looked to be the determining factor for this game. Now for a preview of the upcoming games for Marquette and Wisconsin. Syracuse/Wisconsin: #4 Wisconsin will be playing #1 Syracuse on Thursday at 6:15PM CT. Even with the loss of Fab Melo, Syracuse is still going to be a tough team to play because they have good depth and lots of talent on that team. So, with Melo not playing, I think a key to victory for the Badgers is Jered Berggren, who is going to have to step up and lead this team. I know that Jordan Taylor is the All-American senior and is the sure fire leader of this team, but I feel that Berggren is going to have a big impact on the outcome of this game. He is going to have to get those points in the paint and grab those rebounds as well as being consistent throughout the game. Florida/Marquette: #3 Marquette will be taking on the #7 Florida Gators on Thursday 9:17PM CT. As I’m sure everybody knows, the Gators are coached by Billy Donovon and is known to always have a decent team year after year, as he has had 14 straight 20+ win seasons. Both teams have the ability to score and one thing that I think Marquette is going to have to do is limit the turnovers. One thing that I have noticed is when Marquette doesn’t turnover the ball a lot, they play very well, but when they have have a lot of turnovers it leads to them getting into a funk and playing sloppy. Hopefully this upcoming game does not turn into one of those funks because I believe that the Golden Eagles are a final four team and have great potential. Jae Crowder is turning enough heads in this tournament that may lead to him as a high NBA draft pick. After Thursday’s games, I am really hoping that I can report that it is on the the Elite Eight for both the Badgers and Golden Eagles because they both have been playing really good basketball as of late and I hope that it will continue on to the Championship. Until next time Wisconsin, Beers, Brats, and Championships. The Wisconsin/Syracuse match up intrigues me the most because I have seen the Badgers play often and their patience could be a key against the Zone. Bo Ryan's team will be sharp, but I do worry if Syracuse gets a lead if Wisconsin can overcome that. That was my observation when they played UNC in the fall. Improved, but can they score in bunches if needed?